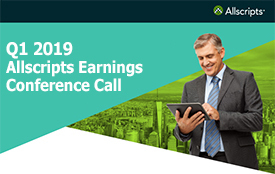 CHICAGO and CULVER CITY, Calif., June 30, 2015 (GLOBE NEWSWIRE) -- Allscripts (Nasdaq:MDRX) ("Allscripts"), a global leader in healthcare information technology solutions, and NantHealth, a cloud-based information technology company, announced they have taken a significant step forward in their strategic partnership through two cross-investments and a strengthening of their commercial agreement. The investments include Allscripts' purchase of a 10% equity stake in NantHealth for $200 million in cash. In addition, NantCapital, LLC, the personal investment vehicle of Dr. Patrick Soon-Shiong, founder of NantHealth, has made a $100 million investment into Allscripts. NantHealth is a healthcare IT company providing the most comprehensive genomic and protein-based molecular diagnostics testing in the market today through its first in class Genomic Proteomic Sequencing (GPS Cancer) diagnostic test, applying this actionable health information to create personalized cancer treatment plans through its sophisticated care planning tool Eviti. NantHealth is in the process of bringing GPS Cancer to the point of care and into the patient's home through a single integrated clinical platform. The Company's vision is to allow IDNs, Academic Medical Centers, Pediatric Centers, physicians, patients, payers, employers, researchers and pharma to coordinate personalized cancer care, enable access to cutting edge clinical trials, monitor outcomes and control cost in real-time. The investments and commercial agreement strengthen the partnership between Allscripts and NantHealth, originally announced in March 2015, to develop an integrated, evidence-based, personalized approach to healthcare solutions, and specifically cancer care. The companies will use Allscripts' scale, global network of hospital and physician clients and leading software solutions, combined with NantHealth's clinical platform, applications and connectivity devices to build out the infrastructure for new personalized, precision medicine programs for our clients to improve cancer care. Going forward, NantHealth and Allscripts are focused on working together to accelerate the dissemination of technologies that seamlessly bring the promise of comprehensive molecular diagnostics to the routine, patient care setting. Specifically, the companies intend to work on joint development of: API-based integration between the two companies' solutions; the creation of a cross clinical-GPS Cancer sequencing knowledge ontology and industry standard; the development of GPS Cancer sequencing invitations via the Allscripts FollowMyHealth® solution; integration of NantTransporter giving access to NantCancer Genome Browser, NantContraster and Paradigm and the development of an ACO solution incorporating semantic interoperability. Research has shown that a physician's ability to make effective, evidence-based clinical decisions can improve by using specifically matched cancer protocols and drugs, delivered to the patient based on the individual's unique DNA, RNA and proteomic profile, and integrated with the patient's holistic clinical picture. http://www.ascopost.com/issues/june-25,-2015/redefining-cancer.aspx ‎For the first time, NantHealth and Allscripts can integrate these two aspects into a unique knowledge-based solution to significantly improve the way clinicians treat cancer. Together, physicians and patients will have the tools to stay engaged and active and provide necessary intervention as early as possible. Leveraging innovations in patient engagement, care coordination and disease management; NantHealth and Allscripts are creating the first fully comprehensive and integrated platform that will provide a transformation to the coordination and delivery of personalized care across the spectrum of integrated health systems, across community ambulatory and tertiary practices. Paul M. Black, President and Chief Executive Officer of Allscripts, said, "We're taking an important step forward in our strategic partnership that fully aligns our resources and furthers Allscripts' strategy to invest in new technologies that can revolutionize service to hospitals and physicians. Under the leadership of Dr. Soon-Shiong, NantHealth is pioneering extraordinarily innovative, personalized healthcare solutions that will empower more efficient and effective clinical decisions. We're confident that our joint efforts will help Allscripts lead the way in our vision of delivering open, integrated and precision-based medical solutions to physicians and patients." Dr. Soon-Shiong stated, "Since the NantHealth/Allscripts partnership began earlier this year, we have come to know Allscripts and its management team well, and I am confident that they can be a major contributor toward the execution of our vision. Allscripts has the technology and scale to become a significant player in a once-in-a-generation shift to personalized medicine. Pursuing unique and innovative partnerships such as this, which can integrate our solutions across the full spectrum of precision care, furthers our mission of building a healthcare ecosystem to drive better outcomes with the highest quality and lowest cost." "North Shore-LIJ has an established commitment to oncology research and the delivery of world-class cancer care," said Michael J. Dowling, president and chief executive officer of the North Shore-LIJ Health System. "Today's announcement of an expanded strategic alliance between NantHealth and Allscripts is exciting, both in terms of furthering our clinical mission and the opportunity to generate additional value from our long-term partnership with Allscripts. We look forward to participating in this alliance as we work together to deliver on the potential for truly personalized care." "Today's healthcare providers are looking for innovative solutions that are integrated across the continuum of care," said Robert L. Meyer, president and chief executive officer of Phoenix Children's Hospital. "Allscripts and NantHealth offer a promising vision for how tomorrow's solutions will provide healthcare professionals with a personalized, comprehensive view of the patient, better analyze data, create precise protocols to drive down costs and improve patient outcomes throughout our healthcare system." Allscripts also announced today that Windber Medical Center, a nonprofit, community healthcare provider, NantHealth client and affiliate, has selected the Allscripts Sunrise™ platform to be the new core electronic health record for its hospital facility, replacing its current electronic health system. Located in Somerset County, in Southwestern Pennsylvania, Windber Medical Center offers comprehensive primary and acute care including a critical care unit, home health and hospice care fitness and wellness programs as well as the Joyce Murtha Breast Care Center. "Windber Medical Center together with the CAP certified and Platinum rated human tissue repository at the Windber Research institute and its partnership with Walter Reed Medical Center is poised to be an integrated cancer center with the most cutting edge scientific genomic research in cancer, and our affiliation with NantHealth and Allscripts will propel us towards our mission of providing 21st century care at the community level," said Tom Kurtz, CEO of Windber Medical Center. NantCapital's investment has been executed through a private placement of Allscripts common stock. Allscripts received gross proceeds of approximately $100 million in the private placement. The combined impact of the expanded commercial agreement and cross-investments is expected to be modestly accretive to Allscripts earnings in 2016 and become increasingly accretive over the five-year term of the commercial agreement. The transaction does not change Allscripts 2015 guidance. NantHealth, a member of the NantWorks ecosystem of companies, is a healthcare transformational cloud-based IT company converging science and technology through a single integrated clinical platform, to provide actionable health information at the point of care, in the time of need, anywhere, anytime. NantHealth works to transform clinical delivery with actionable clinical intelligence at the moment of decision, enabling clinical discovery through real-time machine learning systems. The company's technology empowers clinicians, patients and researchers to transcend the traditional barriers of today's healthcare system. By converging molecular science, near real-time patient signal monitoring, computer science and big data technology, the NantHealth Clinical Operating System (cOS) platform empowers providers, patients, and commissioners to coordinate best care, monitor outcomes and control cost in real-time. This is the first system of its kind in healthcare, enabling 21st century coordinated care at a lower cost, enabling value-based population health management at a single patient level and at the population at large. For more information please visit www.nanthealth.com and follow Dr. Soon-Shiong on Twitter @solvehealthcare. NantOmics, NantCancer Genome Browser enables clinicians for the first time to investigate a tumor genome from the full three billion bases down to the single-base level in real-time, thanks to the power of the NantOmics supercomputing and secure mobile infrastructure. The Cancer Genome Browser integrates with NantHealth's treatment recommendation engine, Eviti, to personalize treatment protocols and clinical trail selection to individual patients based on their genomic and transcriptomic signature. The NantCancer Genome Browser is fully encrypted to allow deployment in a HIPAA secured environment, enabling clinicians to securely access patient data as soon as it's available, wherever they are. Data transfer is one of the largest challenges associated with the analysis of sequencing data. NantOmics has designed an infrastructure capable of storing and processing thousands of genomes a day quickly and securely. Our NantTransporter software application enables secure transport of data directly from sequencing machines to NantOmics's secure private genome processing cloud. Data streams are encrypted using 128-bit Advanced Encryption Standard (AES-128), the same algorithms designated for Top Secret government documents. Initiating a transfer is as easy as obtaining a transfer code from our web site, and specifying the files to be sent. Annotation of the genomes begins immediately with no downtime between transferring and the beginning of processing. NantWorks has built a dark fiber network capable of Tb/sec transfers between hospitals, academic institutions and sequencing centers. In July 2012 we demonstrated the capabilities of NantTransporter by transferring 94 TB of genomic data and achieved speeds of up to 9.55 Gb/sec with a sustained rate of over 8.232 Gb/sec, the fastest and largest documented transfer of genomic data to date. To date we have transported over 15,000 cancer genomes via NantTransporter. Accurately assessing the state of a patient's genome is one of the most powerful tools in the emerging field of personalized medicine. NantOmics applies its leading, novel genomic analyses to rapidly discover variants in a patient's raw genomics data using the latest sequencing technologies combined with advanced statistics and machine learning techniques. NantContraster annotates all variants against a knowledge database comprising all known and probable disease-associated genes to rank the genomic alterations that have the highest clinical relevance. When applied to cancer tumor/normal samples, our analysis is capable of quickly identifying genomic alterations that could lead to tumorigenesis for a fraction of the cost of conventional approaches. NantContraster is capable of concurrently processing many samples to handle large workflows from researchers and hospital settings. PARADIGM (Pathway Recognition Algorithm using Data Integration on Genomic Models) is a proprietary algorithm that uses a probabilistic graphical model to integrate multiple genomic data types on curated pathway databases and is unique for its per-sample approach that allows individual samples to be assessed alone or within the context of a cohort of interest. This press release contains forward-looking statements within the meaning of the Private Securities Litigation Reform Act of 1995. These forward-looking statements are based on the current beliefs and expectations of Allscripts management, only speak as of the date that they are made, and are subject to significant risks and uncertainties that are inherent in the industries in which Allscripts and NantHealth operate. Such statements can be identified by the use of words such as "future," "anticipates," "believes," "estimates," "expects," "intends," "plans," "predicts," "will," "would," "could," "can," "may," and similar terms. Similarly, statements in this release that describe the transactions between Allscripts and NantHealth and the investment in Allscripts by NantCapital, including the financial impacts of each, and other statements of managements' beliefs, intentions or goals, are forward looking statements. Certain factors that could cause the results of the transactions described in this release to differ materially from those described in the forward-looking statements include, but are not limited to, customer acceptance of the products and services offered by each of Allscripts and NantHealth, the ability of Allscripts to maintain or expand its business with existing customers, Allscripts' ability to establish and maintain strategic relationships, including with NantHealth, and Allscripts' failure to compete successfully. Additional information about these and other risks, uncertainties, and factors affecting Allscripts' business is contained in Allscripts' filings with the Securities and Exchange Commission. Allscripts does not undertake to update forward-looking statements to reflect changed assumptions, the impact of circumstances or events that may arise after the date of the forward-looking statements, or other changes in its business, financial condition, or operating results over time.